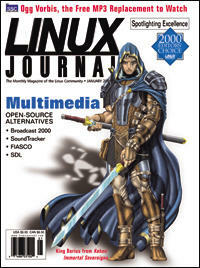 This article is based on a chapter from the author's book Linux Music & Sound, published by No Starch Press in October 2000. FIASCO provides state-of-the-art image and video compression. Broadcast 2000 aims to bring together the art of making movies and the power of the Linux platform. Seven Linux enthusiasts broadcast a weekly internet radio show. LaMonica describes the hardware and software technology used on the server side of the streaming process. Kreimeier explores one of Loki's free software projects. An adaptation of a chapter from the author's upcoming book. Ogg Vorbis is the Open Source Community's hot alternative to MP3. The best code reviews are the ones that actually get done.